Owning a D-45 is not about bringing it on stage and performing with it. It is about owning one of the best proper acoustic guitars money can buy. The d 45e retro Dreadnought is the flagship model of the Standard Series. It is the most ornate Standard Series instrument, featuring hand inlaid pearl and premium tonewoods. The guitar of choice for legends like Gene Autry and Stephen Stills, it’s the perfect guitar for a discerning collector or musician. Nothing says you’ve arrived like a D-45. Martin has put more than 900 individual pieces of abalone into the bindings and inlays of the top, sides, back, and rosette of the D-45 Dreadnought Acoustic Guitar. Large 'C.F. Martin' abalone letters adorn the headstock; abalone hexagon inlays are used as position markers on the bound ebony fingerboard. Solid spruce top and traditional Martin bracing pattern generate fantastic tone from this beautiful guitar. There is not doubt that the Martin D 45s acoustic guitar is Martin's flagship dreadnought guitar,is one of the world top best acoustic guitar which is liked by numbers of guitar players. The D45 represents the most elegantly appointed dreadnought in Martin's standard collection. You get it all with this guitar: a luxurious sound, gorgeous appointments, and the kind of playability that makes you want to pick it up again and again. It's no coincidence that prewar D45s are some of the most sought-after guitars in the world — and not just because they're so rare; the D-45 model is simply the pinnacle of Martin's premium brand do not be hesitated for this Martin d45 China copy guitar to get a factory price for the d-45 replica guitar. Guitarsofchina is a professional manufacturer of premium acoustic and electric guitars.GuitarsOfChina supplies high quality acoustic guitars in the market for years.GuitarsOfChina provides custom shop service. We personalize your guitar according to your requirements.This special customized Martin D-45 is exactly for all D45 acoustic guitar fans and lovers,you may first be drawn to the D45 by its elegant looks, you'll soon find that the heart of this guitar lies in its big, detailed sound. This custom Martin D45's back and sides are built from solid Indian rosewood, which, in combination with the solid Sitka spruce top, braced for a huge bottom end, provides an unmatched playing experience. You'll also love the D45's premium solid black ebony fingerboard and bridge.Thus, the first D-45 was born. This beautiful dreadnought still boasts abalone pearl top, side, and back inlays, and its fingerboard features distinctive hexagonal Style 45 position inlays. 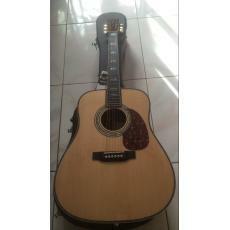 We are professional manufacturer of all kinds of high quality acousticguitar,electric guitars,classical guitars. We can also take custom-made all kinds of acoustic guitars,handmade high-end acoustic guitars according to your special requests. Hi just have quick question for you. is that guitar made of solid woods all around guitar as you described? Hi, does it come with Fishman Aura VT Enhance electronics? Please can you send some pictures? Thank you. I would like to order this guitar. I would like insured shipping. the guitar, the case and shipping insurance to Spain?